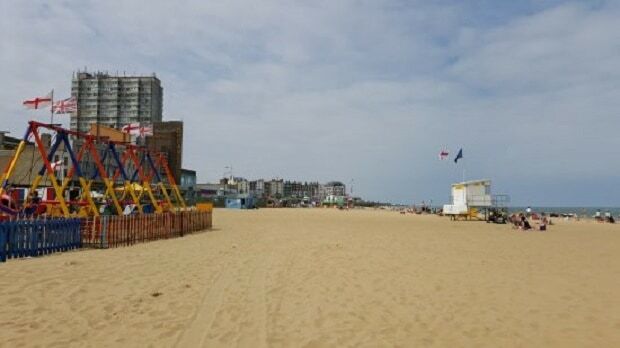 A licensing application has been made by organisers who want to hold a two-day music event – with a 20ft bar – on Margate Main Sands this Summer. The application is for the bank holiday from August 25-27 although it states the event timings as just the Saturday and Sunday (August 25-26) from noon to 9pm each day. Events company Happy Days Parties are planning to use the area of the beach opposite Dreamland which will be fenced off and contain a stage for live music and dance performances. There will also be recorded music. Kent Police has not objected to the application for the over-18s event but says there are conditions that would need to be put in place. The response from Chief Inspector Sharon Adley says: “I have to note that the bar is 20 metres longs which is a significant size to say the least. “Such a large bar would need security on its own rather than the entry/exit marshalls. Conditions would include no glass bottles, toughened glass/plastic containers for alcohol, at least 4 door supervisors with 2 being female, a Challenge 25 scheme in operation, a lockable drugs box to be on the site and the use of CCTV. The list of conditions also say those under 25 not to be allowed on the premises. The premises licence application will be discussed by Thanet councillors on the licensing committee on May 8. This will be a waste of time, it will be packed on the beach with our ethnic friends from London. They will obviously leave all their crap on the beach. As they do every other august. rubbish is left on all beaches across the country over the summer by locals and visitors alike. No Ed D. It has been an ongoing problem here on Margate main sands for several years. No consideration to other beach users on this busy weekend has been given in the past by these bashes organised in London for daytrippers from London only. Why should part of the beach be given up to loud music and boozers every August bank holiday to the detriment of all others. They don’t stay within the boundaries fenced out. It is always a problem with complaints of noise and rubbish dumped on the beach by those with no respect for Margate. They just want to use the beach for their own parties then leave the place in a mess. Cars are always parked all along the pavements and yellow lines too during the past unlicensed events causing obstruction and danger issues. There needs to be a resounding ‘No’ sent out so everyone can use the beach equally and respectfully without the abuse to their hearing and wading through tons of litter and bottles. Actually it was always the last Sunday in July..I wasn’t aware that is a bank holiday …. Don’t want to be a party pooper but surely Dreamland has enough party atmosphere for everyone? It’s gonna be miserable for those on the beach but not at the ‘party’. All noise and no enjoyment? I also think biodegradable glasses/cups should be mandatory for any public event on a beach. We have to start taking care of the environment and the sealife that will end up ingesting the rubbish left behind! James Malyn, maybe you could campaign for segregated beaches so you wouldn’t have to come into contact. Also if organisers pay for beach clean there is no reason not to have a bit of music and fun. True – but there’s loads of music & fun in Margate. I am more concerned that, with the amount of plastic being dropped (as it is bound to be) on the beach, much of it will end up in the sea/buried in the sand. If the ‘clean-up’ doesn’t happen until the next day – it’s too late – it’s in there. Why not use paper based containers at least? Are we not supposed to be responsible now? By that I mean responsible for what we do to sealife and the planet in general? Good for Margate!! We have plenty of beaches in Thanet, perhaps as part of the licence we ask for some additional info of other beaches to be published and a “Free” bus service to these beach locations? All the mess and noise aside, it’s great for the local community in the way that it brings money into Thanet, stop whining, the festivals last two weeks then they are gone, a small sacrifice to pay for living in a ever impoving seaside town. The only concern I have is the ecological one. TDC struggle to keep the streets and park and beaches clean as it is. I know from first hand that they simply do not employ enough staff. Love a good party but how does plastic cups help on a beach? That is the thing that needs to be addressed. With the best will in the world, much of that will end up in the sea.